Streets near Changfeng Park will be temporarily closed from Saturday midnight to 9:30am on Sunday. 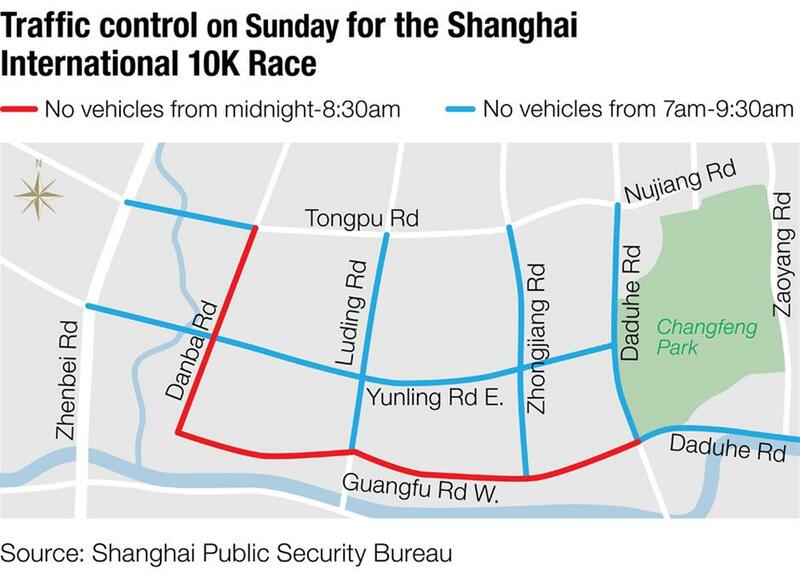 Shanghai International Elite 10K Race takes place on Sunday — the second year the race will have been held — and streets near Changfeng Park will be temporarily closed to traffic. From midnight Saturday to 8:30am, all vehicles will be banned from using Guangfu Road W. between Daduhe Road and Danba Road, and from Danba Road between Guangfu Road W. and Tongpu Road. From 7am to 9:30am, parts of Daduhe Road, Yunling Road E., Tongpu Road, Luding Road and Zhongjiang Road will also be closed to traffic. Elsewhere along the route of the race, vehicles will be temporarily restricted while runners are passing. Some buses running in the area of the race will be suspended or rerouted, police said on Monday. The race, which has been introduced by organizers of the Shanghai International Marathon, is the largest 10-kilometer race held in urban districts of Shanghai. This year the number of participants rose from 5,000 to 6,000 — with 5,400 running the 10km race and 600 taking part in a 2km family run.